For most of my sisters’ and my childhood our mother stayed at home and took care of us. For years and years she did mountains of laundry, kept a neat and organized home for us, and cooked three meals a day. Three full meals. With a family of five that was a lot of laundry, housework, and cooking! I think it was around the time that my youngest sister started to school that Mama decided to go into business for herself. She’s very artistic and has always had a real flair for working with flowers, so she opened up her own floral shop. Her florist was our enclosed garage which was about 10 steps from the back door. So now, in addition to all the cooking, cleaning, and laundry, she had a full-time business. A business practically in the house with her. A very successful business which didn’t even give her a chance to get away from the house for a few hours a day. I can remember many days waking up to find Mama had already been at work for several hours in the florist and was coming in to prepare everyone’s breakfast. I can also remember many days when Mama cooked supper, got us all bathed and tucked into bed and went back out to the florist to work some more. Nights when she never put her head on a pillow but worked right through until daybreak. Thankfully those were rare occasions – large weddings and the like. Every once in a while, on those busiest days, Mama would accept a little help with meals. We’d order hamburgers from one of the local restaurants or Daddy would take us out to “Nick and Jean’s,” one of the few sit-down restaurants in our little town. And then sometimes, but just rarely, Mama would let us have “TV dinners.” Oh, what a treat we thought that was. Now, this was the 1960’s and TV dinners were the height of space age convenience. A complete meal frozen in a little aluminum tray. No prep work. No cooking. No clean up. Pop the whole thing in the oven for about 30 minutes and out came dinner. What a very modern family we were with our TV dinners! And, of course, you had to enjoy your TV dinner on a TV tray while watching TV. Who remembers those folding metal TV trays? Mama would let us choose which ever kind of TV dinner we wanted. Not that the choices were very wide ranging. Best I remember there were fried chicken dinners, turkey and dressing dinners and, my favorite, Salisbury steak. Oh yeah, that little seasoned ground beef patty floating in gravy accompanied by mashed potatoes, peas and carrots. Yum. Well we thought so back then anyway. In a fit of nostalgia a few days ago, I began to wonder if I could create an updated Salisbury steak. One that would fit more with today’s tastes and diet, and I think I’ve come up with a pretty good one here. If you were a child in the 60’s growing up with all the new space age inventions and conveniences, I think you’ll appreciate this recipe. Be sure to let me know what you think! An updated version of the classic Salisbury steak with chunky mashed potatoes. Spray a large skillet with cooking spray and place over medium heat. In a large bowl, combine the ground beef, garlic powder, salt, and black pepper. Mix lightly until well combined. Divide in half and form two patties. Add the patties to the heated skillet and cook until nicely browned on both sides. Remove patties to the skillet and set aside. Remove excess fat from the skillet, leaving only about 2-3 tablespoons. Add the sliced mushrooms, chopped onion, and thyme. Cook until the mushrooms are browned and the onions are translucent. Sprinkle the flour over the mushrooms and onions in the pan. Stir and cook for two or three minutes. Add the beef broth. Cook, stirring, until the mixture begins to thicken. Return the steaks to the pan, reduce the heat to medium-low, and cook until the gravy is thick and the steaks are cooked through. Cut the cleaned potatoes into large chunks. Place them in a pot with enough water to cover by 1/2 inch. Reduce the heat to medium and continue cooking until potatoes are done. Drain the potatoes and return them to the pot off the heat. Add the butter, sour cream, salt, and pepper. Mash with a potato masher or beat with a handheld mixer. Add enough milk to bring the potato mixture to desired consistency. Serve the steaks over a mound of mashed potatoes drizzled with the gravy and garnished with chopped green onions. You’re welcome, Mari! I really hope you enjoy it. I never really liked the meats, but always thought that the mashed potatoes were pretty good. Loads of sodium and starch have always appealed to me. Potatoes, and the apple cobbler if we were lucky enough to get one with a dessert. I’ve had Salisbury Steak on the brain too but haven’t gotten around to making it but I am now inspired to!! She is amazing, Nancy. She has spent her whole life working and taking care of people. First me and my sisters, then my Daddy through years of fighting lung cancer, and now she cares for her 96 year old mother. In between all that she ran a successful floral business, then she was head of the local chamber of commerce. After she retired she ran for and was elected chairperson of the county commission. I honestly think next time I might *gasp* break down & buy regular ground beef for our salisbury steak. I find the lean ground beef makes the salisbury steak a wee bit tough even though it’s just barely cooked past the pink stage. Oh gosh, I remember eating TV dinners off metal trays watching the Ed Sullivan show, or I love Lucy, or Whats my line, or whatever, as well! I know my Mother really enjoyed the ease of TV dinners once in while, as she worked full time even back then. My sibbling & I were the classic Latch key kids, as were many of our school mates who had working parents. I wonder if theres even such a thing allowed nowadays? It’s funny. The old saying, what goes around, comes around, is so very true. Now being in our senior years, & for years scorning foods such as TV dinners, as unhealthy food for our now, adult children, my DH & I started buying TV dinners again, a few months ago. I’d noticed them in a grocery store flyer, 6 dinners for 10 dollars, and thought, what the heck, lets give them a try & see how they’ve changed. Now we enjoy a TV dinner as a quick supper every two weeks, most always, on a saturday or sunday, as the weekends have us out and about so much. We eat them the same as we did when we were youngsters. In front of the TV, off a tray, but the trays are no longer metal, they’re made of sturdy wood. 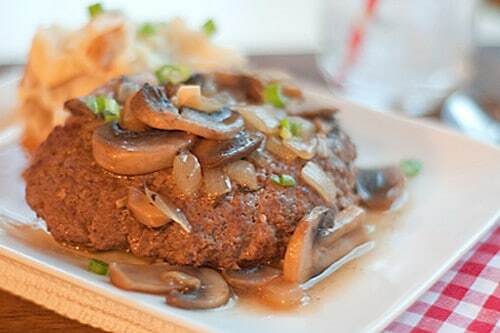 Funny story, when my brother and sister (and myself) were little in the 90’s my mom would sometimes buy Salisbury Steak from the grocery story (the Banquet kind) and we would DIE for it! We loved it to much, one time my mom asked my brother what he wanted for dinner and he was like “I want steak, we had it a little bit ago” and she was sitting there thinking “steak? when did we have steak?” And he told her the kind in the package with the gravy and she found out it was salisbury steak! It was such a cute moment because she thought he really wanted an actual steak! I must make this recipe soon!